Chess has moved quickly to maintain a presence in this modern world. Equipment has been produced in modern materials which have considerably reduced the cost of boards and pieces and brought the purchase of these well within the budget of normal chess players. Clocks have gone through various periods of development, starting with sand timers, wooden mechanical clocks and now digital battery operated appliances which can be set to a multitude of timings. Controllers can now arm themselves with computer programmes that can produce pairings and placings for the most complicated Swiss tournaments in a matter of seconds. Players skills can be assessed by the application of mathematical formulas etc. etc. 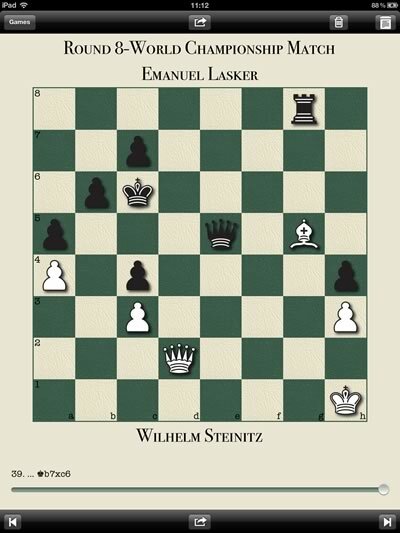 However, there is one aspect of competitive chess that has virtually remained the same for hundreds of the years - the recording of moves played in a game. Alright, it can be claimed the quill was replaced by a metal nib, that was in turn replaced by fountain pens and latterly ball pointed pens, but paper has remained the same and recording is still a matter of human endeavour. This has led to many problems, not the least being bad lithography that makes the moves understandable only to the person who did the recording. Pity the poor reporter that has to use these bits of paper to bring to the attention of the world an otherwise hidden masterpiece. It is also a problem with handicapped players who have a problem writing or writing legibly. You record your moves, email the PGN file to your desktop computer and import the PGN file into your chess database (ChessBase, HIARCS Chess Explorer, ...) for analysis. The app does not enforce Airplane Mode. Games can be edited at any time. There are options to check for illegal moves or positions. Designed and written by a chess player who averages over 100 USCF rated tournament games a year. Games can be emailed as a PGN (Portable Game Notation) file attachment that can be loaded into your chess database. The email body (text or HTML) includes the game notation to review or print. Supports portrait and landscape orientation with LEFT and RIGHT hand landscape layouts to make the best of cramped tournament conditions. You can select frequent opponents from your contacts or type in their name. Options to check for legal moves and positions (Not available on Tournament Edition). Option to include the time spent on each move in the scoresheet notation. Keeping a score sheet is required for tournament games and essential in order to review your games to improve. Keeping a paper scoresheet distracts you from your game and they are prone to errors. Then the game needs to be manually copied into your chess game database. 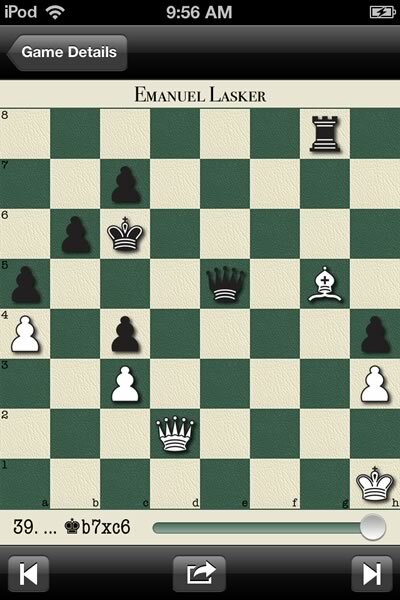 With Chess Score Pad there is no need to translate the move to the coordinates or risk forgetting to record a move. You simply drag or tap the piece to the new square. Then, after the game you can email the PGN file of the game and import it to your chess game database for analysis and review. Between games at a tournament it is easy to find critical positions to review with the live position slider. If you need a hard copy of the game you can print to an AirPrint printer or the email contains a the algebraic notation record of the game. Is there a method of game analysis available? There is no option available that will check for illegal moves - this is a matter for the players to identify, not a machine. Will the appliance make allowance for the time normally used in recording moves by the normal manual process? These are just some of the reservations an arbiter must consider when assessing a request that a game recorder be used. A main consideration must be that an analysis of a position is not available. In modern days electronic methods of providing a player with such information is becoming increasingly available. It has been recorded that a player has been receiving information whilst playing, by means of an appliance placed in his shoes and read by his toes! No one could blame an arbiter for being suspicious of an application to the extent of not allowing it to be used. A few years ago (I am relying on memory) there was an application that had the universal approval of arbiters and was used extensively in several international tournaments. In fact a tournament was sponsored by the makers of this particular game recorder. For some reason it then disappeared and I have no record of it being used since and no explanation was available on why this action was taken. Is it now beyond the resources of the makers of game recorders to persuade FIDE on all aspects of the fitness for purpose of such electronic aids as I feel sure that it's benefits far outweigh the reservations against its use. If FIDE were to tackle this problem and make such a pronouncement I am sure that it would benefit the game as a whole.